Situated not far from the Spanish-French border, this seaside resort of Saint-Cyprien invites you to take a family holiday in the Mediterranean. There are different kinds of sports activities available here, such as sailing, water skiing, fishing, golf, horse riding, tennis or squash. The tree-lined residence in the heart of the village consists of 150 terraced houses with patio and garden furniture and is just 250 metres from the beach. You can stay in type 3 rooms (FLP111 and FLP113 which is the superior version of FLP111, completely renovated and decorated with air conditioning, and more equipment) or 4 rooms 6/8 people (accessible for disabled people). The units are built around the pool and paddling area (open from April to October depending on weather) and the playground. Parking space is also available. One small pet is allowed for a fee of EUR 35/Week. Laundry is charged. TV: EUR 40/Week. Cot or chair: EUR 16/Week. 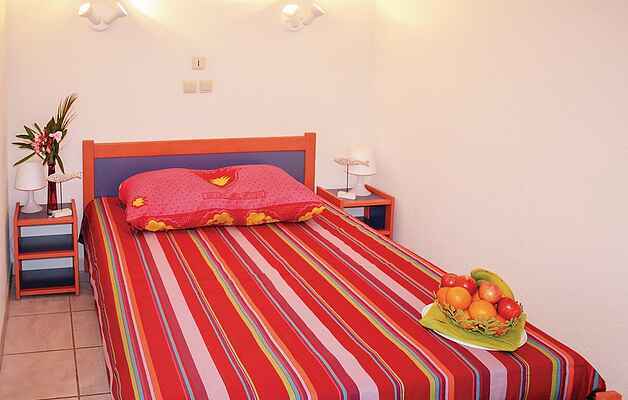 Wi-Fi in the hired accommodation: EUR 22/Week. Wi-Fi at the reception: EUR 5/Hour. Barbecue: EUR 5/Day or EUR 20/ Week. Heating costs, if any, will be charged at the rate of EUR 0.20/ kWh payable locally. A playground for children is also available. Beach Umbrella : 7 euros/week.